A look in the Beamish stores can turn up the most unexpected things – we’ve been working on putting together a selection toys and games to loan to the Bowes Museum for their summer holiday exhibition. It’s always nice to be able to help out a fellow museum with a loan, and it gives us the opportunity to spend some quality time in the stores. We’ve looked at all manner of toys from automota to teddy bears, dolls to Victorian toy building stones (the name doesn’t lie – these are actual stones, and really heavy!). 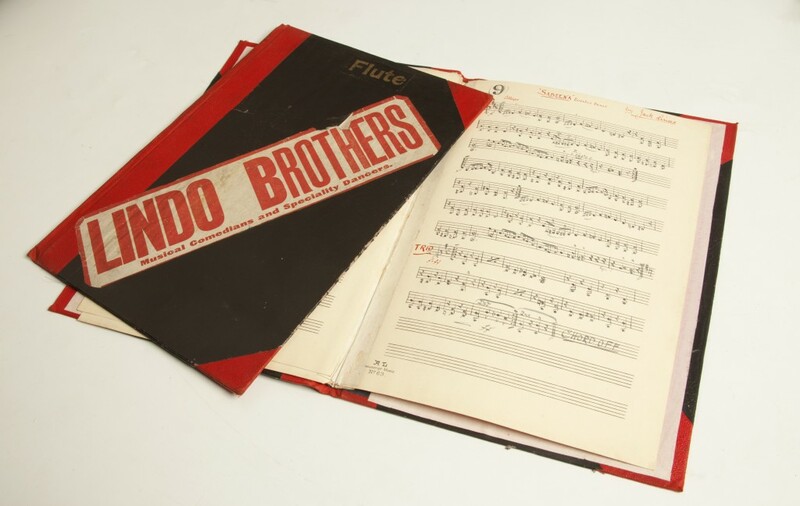 NCB – a bargain at £200! Home of the Magpies and the hottest property on Monopoly Newcastle’s board! 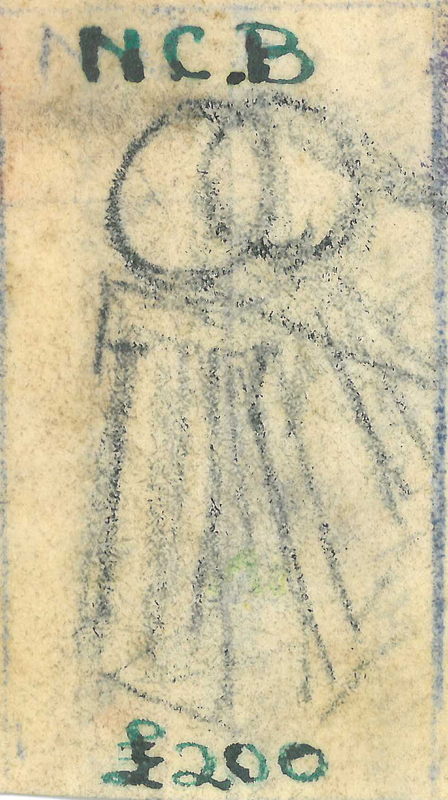 Yet more surprises lurk on the back though – the board is actually drawn on the back of a historic legal agreement. 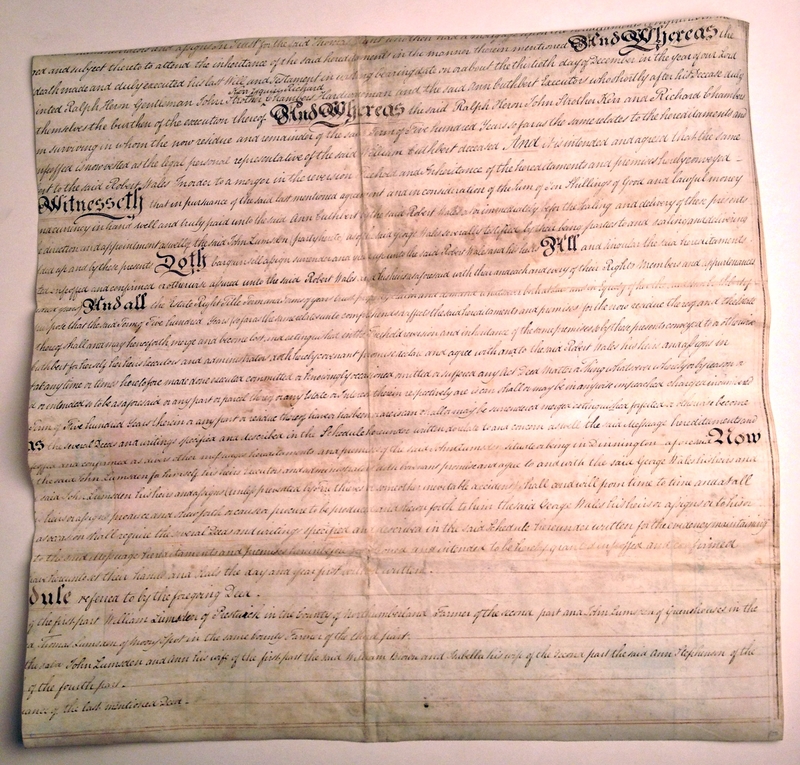 It’s a legal paper relating to a land agreement between farming branches of the Wales and Lumsden families, in the wake of an inheritance from a man named William Cuthbert.There’s quite a lot missing – the paper has been cut, folded and trimmed to Monopoly size. It’s appropriate in a strange way that a game so focused on land and property should be played on the back of a document like this. 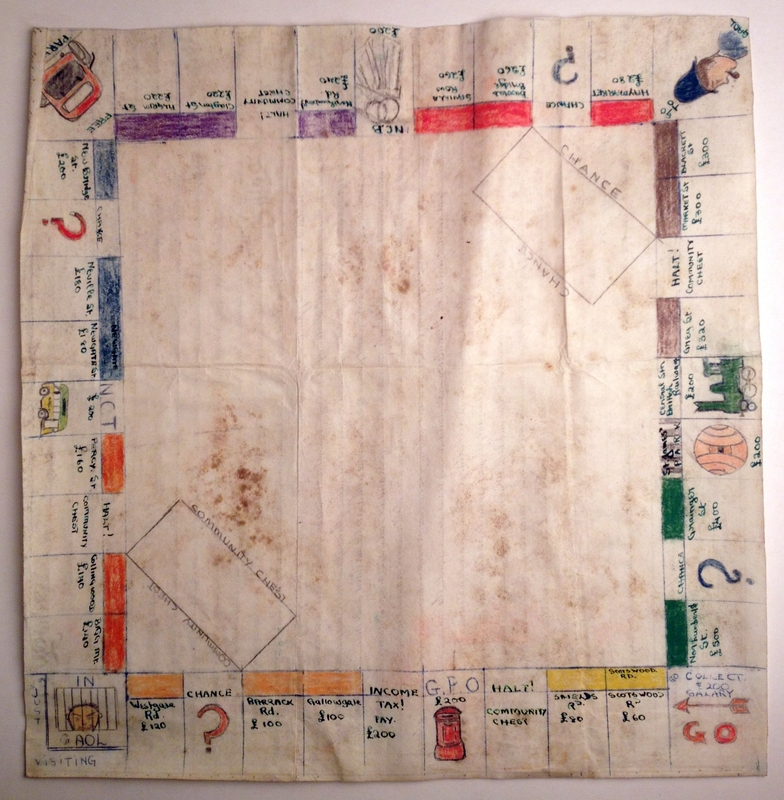 The forerunner of Monopoly as we know it was ‘The Landlord’s Game’, developed by Elizabeth Magie in the United States in 1903. Elizabeth invented the game to demonstrate the often terrible effect of land monopolies – a long way from the ‘buy it all’ game that we now play. 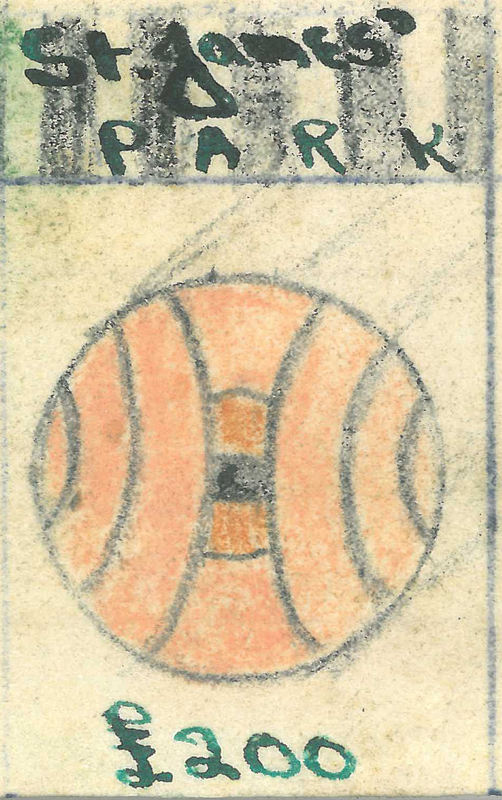 It is a unique and fascinating object, and offers us a real snapshot of what was happening when it was drawn up. We don’t have a specific date for when the board was made, but because the NCB was set up in 1946 and took over the pits in 1947 we know it is definitely postwar, and we estimate that the board probably dates from the 1950s. If you can shed any light on who might have made it, please let us know! This little board tells us about local pride, the nationalisation of industry, the re-use of materials, hobbies and pastimes and even 19th century land agreements! It just goes to show how just one object can tell us many stories if we look carefully enough at the details – even the policeman is subtly different, with the usual Monopoly American-style cop replaced with a proper British bobby, and ‘JAIL’ with the pukka British ‘GAOL’. Nowadays, Monopoly versions of many different cities are a common sight – Newcastle and Gateshead have had their own officially licensed version of Monopoly for some time but our board shows that an enterprising northeastener got there first. It’s a long way from Atlantic City, the location of the original game, but I reckon Scotswood Road and Grainger Street beat Park Place and Boardwalk any day of the week! Have you ever made your own version of a game? 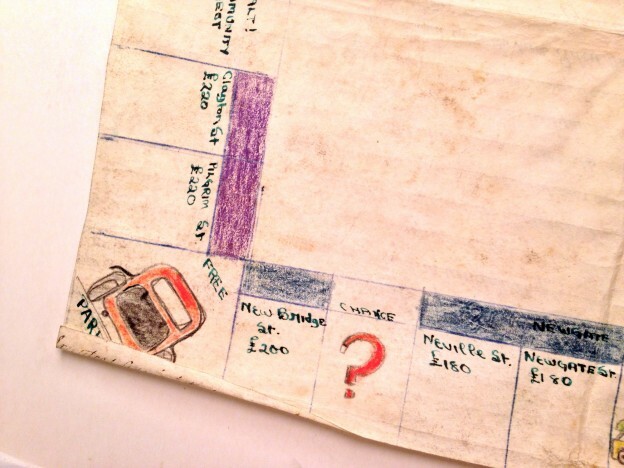 What about your Monopoly memories – were you a successful junior tycoon, or were you usually mortgaged up to the limit? Did conflict ever break out over the little green houses? It always did in my house! This entry was posted in Adventures in Collecting and tagged games, Monopoly, Newcastle, St James' Park, toys on March 27, 2013 by BeamishMuseum. My name is Alice and I have been volunteering at Beamish Museum for the last few months. Initially my role in the museum has been looking through old magazines from the 1950s and finding interesting advertisements and pictures of large objects from the period that Beamish may find it hard to come by or display. In doing this I quickly became aware of the changes and attitudes that these advertisements showed about the people they were targeted towards, in particular those towards women in the ‘Housewife’ and ‘Women’s Weekly’ magazines. It seems as though magazine advertisers put a lot of pressure on women to be perfect housewives. Personal beauty, taking care of your home, husband and children are all repeatedly highlighted as traits women should display. It seems as though these adverts fed into a culture of display, with women mainly concentrating on the image of themselves that they gave to others. This links into the fact that communities in the 1950s were usually a lot more close-knit than they are nowadays, and so a woman’s reputation was very important. In the post-war years a return to day-to-day life meant that a lot of women returned to their role as housewives. The end of bomb scares and the rise in technological advances meant that home improvement was high on the agenda for many families. 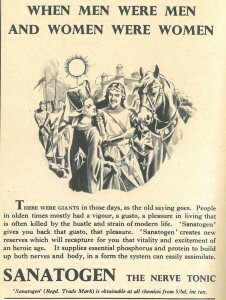 Magazine advertising played into this with ideas of what was once only aspired to becoming achievable. There are many adverts, like this one for a Hoover electric washing machine, telling women that the item is not only going to change their lives for the better, but is also in high demand, insinuating that most women could afford it. Whether this was true or not is another matter. Adverts like this also show us that a housewife wanted higher standards of cleanliness in her home and gives the impression that there was a lot of gossip centered on the hygiene of a woman’s house. 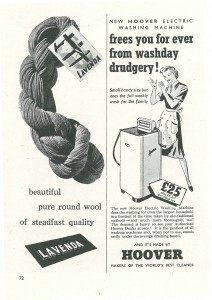 Hoover – no more washday drudgery! 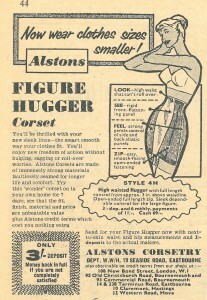 Other adverts in these magazines also highlight pressures that housewives faced. 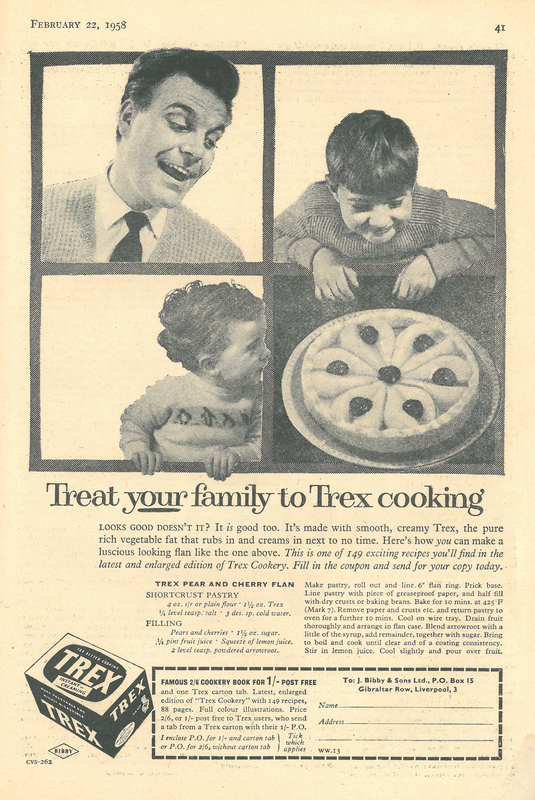 This Trex advert from 1958 shows us the importance of a woman’s cooking to her family. The image of the all male family members looking in delight at the dish would prompt women to buy the product, as well as the description of it making cooking easier and taste better. 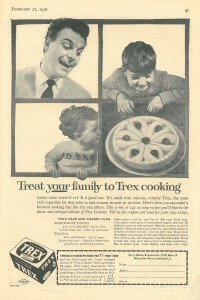 The slogan ‘Treat your family to Trex cooking’ would make it seem to the reader that her dish would go from being something normal to a special treat. There are also a lot of advertisements for painkillers, ointments and other products to keep a family healthy or cure them when they are unwell. In most of these adverts the wife of the family is the main care giver and provider of these products. In short, it was completely up to her to look after the whole family and be prepared for if they were unwell. Today we think of Lucozade as a sports drink, but in the 1950s it was used to help people recover during and after illnesses. It was even used in hospitals and could only be bought from chemists. In this advert from 1955 we can see that the idea of the woman nursing the family has been illustrated literally, as she is dressed as a nurse and attending her father. The caption that goes with the advert stresses the necessity of Lucozade for recovery. This advert also shows us that perfect 1950s women were responsible for all of the men in their life; her husband, children and father, and she was depended on to care for them. This advertisement from 1951 for a health tonic also shows that advertisers used the still present divide between women and men to promote a product. 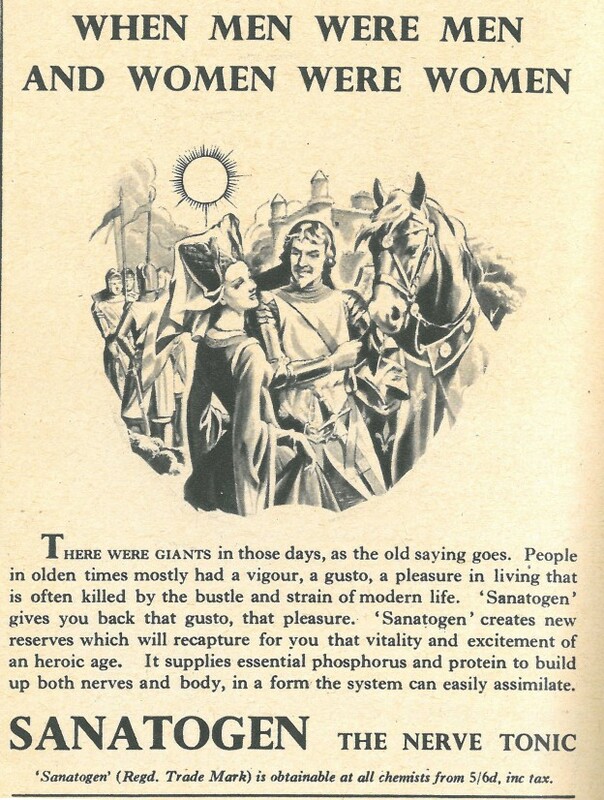 Here the advert is wishing back to a medieval ‘golden age’, where women were women and men were men and everyone stayed in the roles that their gender restricted them to. This advert shows that opinions at the beginning of the 1950s were still very far from the ideas of freedom between the sexes that flourished in the 1960s and that we still uphold today. As well as housewives being able to fulfil all of the roles expected of them, 1950s women’s magazines also advertise a lot of beauty products. This is not unexpected in a women’s magazine of the time, but the slant of the adverts shows a very high level of expectation with regards to a woman’s appearance. 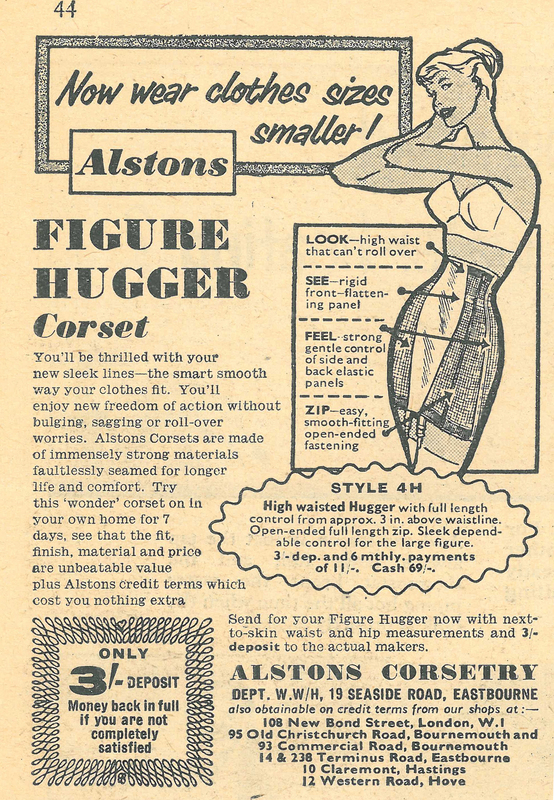 With all of the adverts plugging their products for ease of living for housewives, it is unexpected that they would still be widely advertising corsets in 1958. 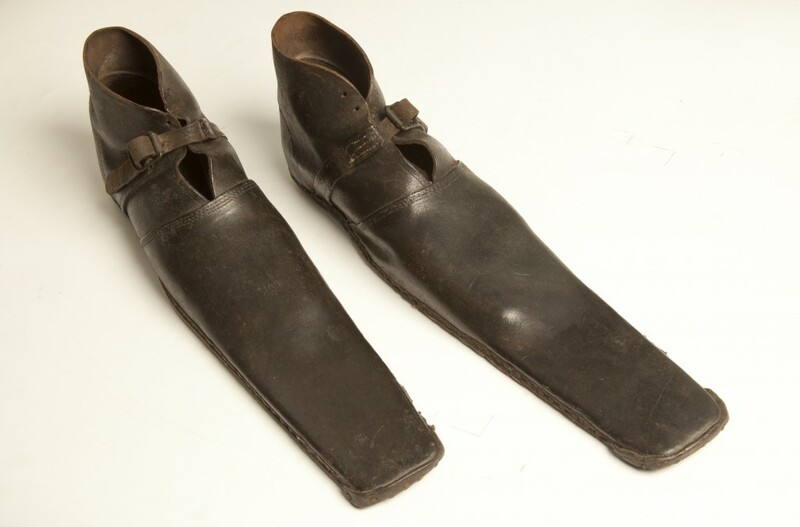 The fact that they are shows that women were still expected to put looks over comfort in their daily lives. 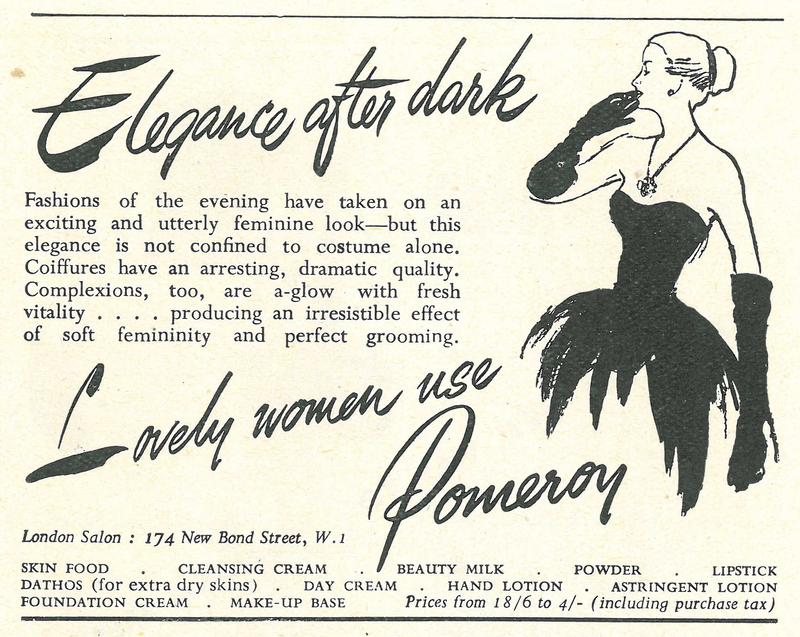 Other advertisements for cosmetics focused a lot on inclusion and exclusion in the way they talked to women. 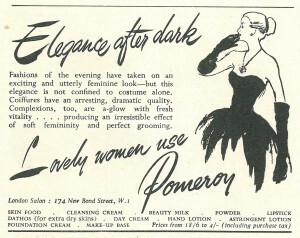 One face powder advert claims ‘Lovely women use Pomeroy’, implying that everyone who doesn’t use it is openly showing themselves in public as not being the ‘ideal lovely woman’. These adverts played into the importance of a woman’s reputation and what was needed to maintain it. For many housewives during the 1950s many of these items would be considered a luxury, for some they may have even been unattainable. We live in a very different world now, but advertising still looms large in all our lives and it doesn’t always keep pace with changes in society – do you think advertising has changed a lot since the 1950s? This entry was posted in Adventures in Collecting on March 14, 2013 by BeamishMuseum. 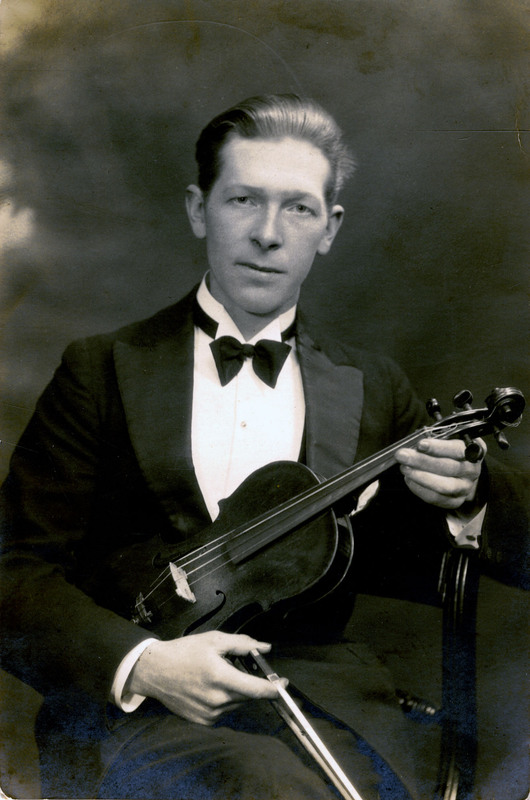 Cetaceum, Resina, Potassium Tartrate; no, they are not celebrity baby names, they’re some of the substances available in the early twentieth-century from ‘Hallaway’s’ chemist’s of 5 Devonshire Street, Carlisle, writes David Rounce. 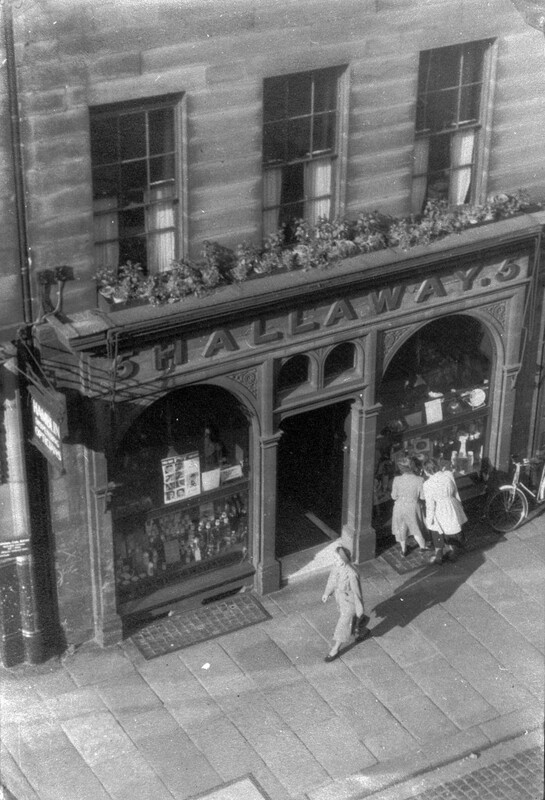 ‘Hallaway’s chemist’s of 5 Devonshire Street, Carlisle. 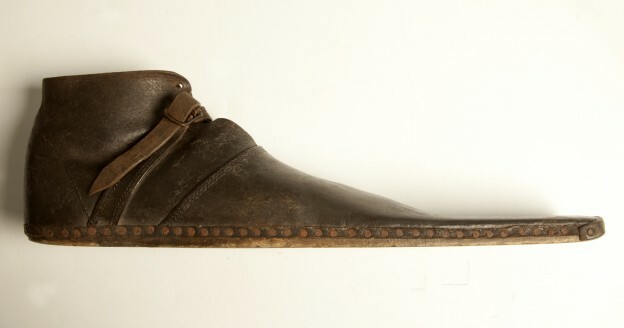 Photographed in the 1950s by James Hall, the last owner. As our curatorial team continues to delve into the museum’s off-site store, one of the many fascinating collections we’ve encountered has been from this chemist’s shop. 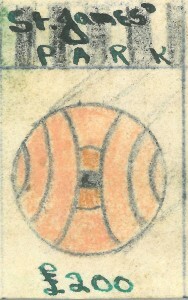 The evocative gold labels on ranks of drawers with their ornate glass knobs, not to mention shelves, cupboards and an intriguing array of half-empty glass bottles, prompted a little digging through the museum’s files which revealed more about where these fittings came from as well as the remarkable story of their survival. 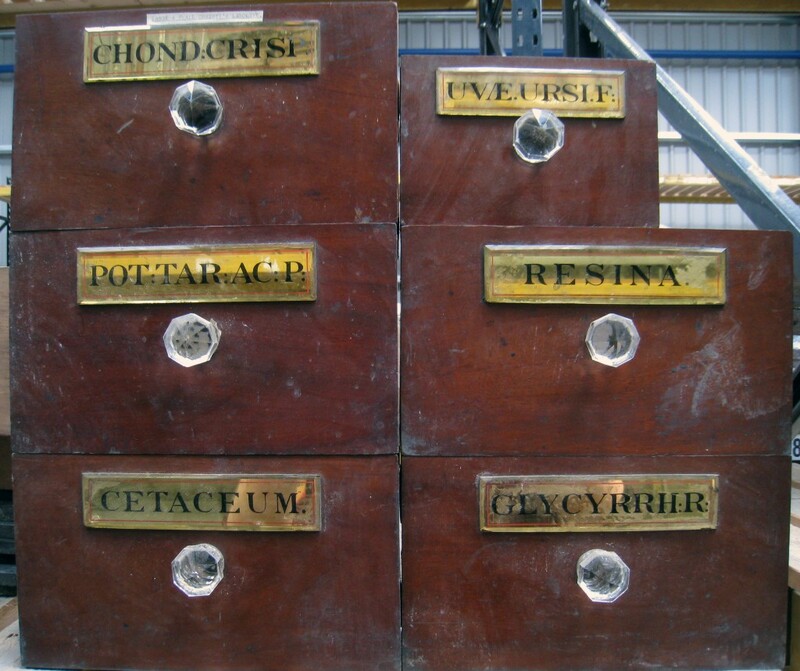 Some of the many exotically-labelled drawers recovered from the chemist’s. Carlisle-born John Hallaway was registered as a pharmaceutical chemist in 1858, aged 22, and set up his own business in the city. 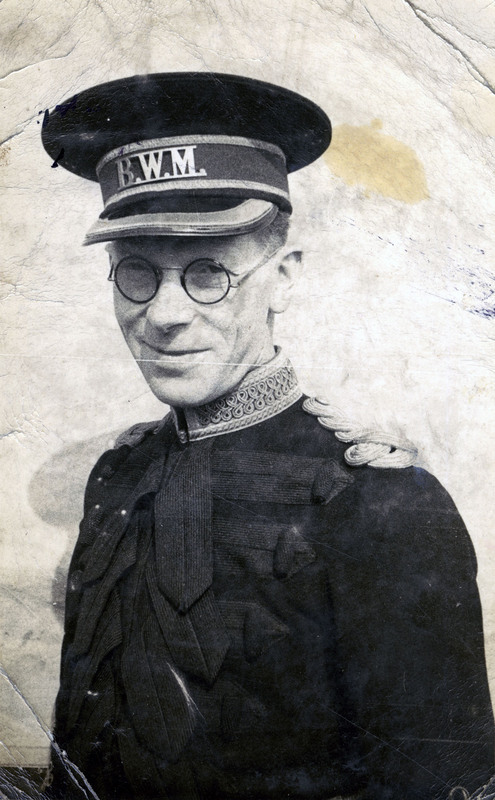 In 1892 he moved premises to Devonshire Street and was joined by his son Robert who took over the chemist’s on John’s retirement in 1916. A small selection of the surviving fittings and bottles. Robert Hallaway himself died in 1923 but his successors continued trading under the ‘Hallaway’s’ name until 1959 when the last owner, James Lothian Hall, retired for health reasons. Although he hoped somebody might take on the business, it was not to be and 5 Devonshire Street passed to the Abbey National Building Society. All seemed lost until salvation arrived in the form of Mr and Mrs Jocelyn Morton who, concerned that this example of a typical Victorian chemist’s shop would be lost, bought and removed the interior furniture which they then had installed in their kitchen! 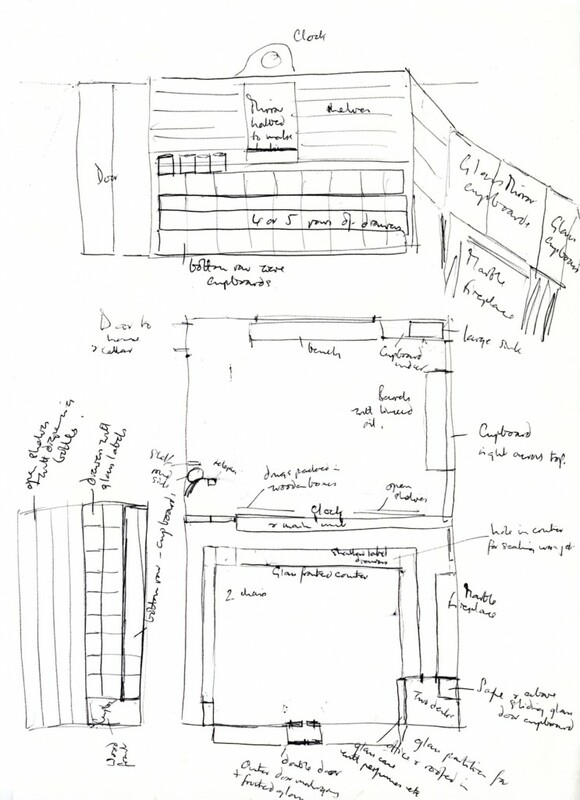 Sketch by James Hall showing the layout of the ‘Hallaway’s’ shop fittings. In 1976 the Mortons were moving house and the new owners, perhaps understandably, did not want a kitchen full of Victorian chemist’s furniture. 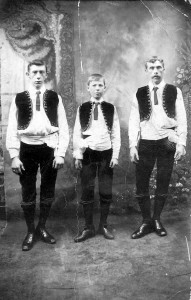 Keen to see their collection preserved the Mortons then offered it to Beamish. 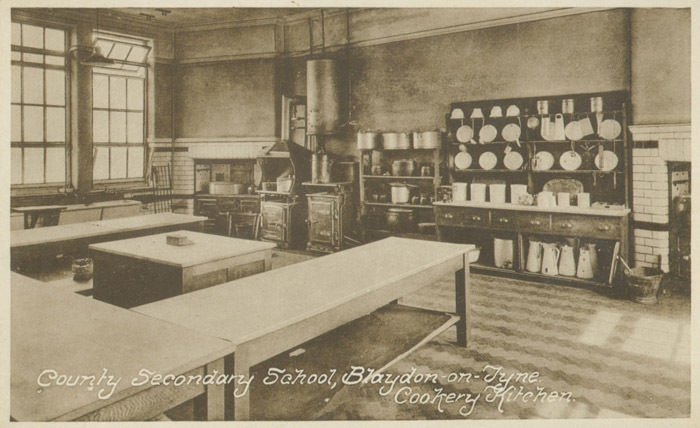 At that time the museum had a re-creation of a Stockton chemist’s on display in Beamish Hall, but the ‘Hallaway’s’ fittings were accepted and put into store for the future. Today 5 Devonshire Street is a bank although the ornate Victorian frontage has changed little since John Hallaway opened for business. 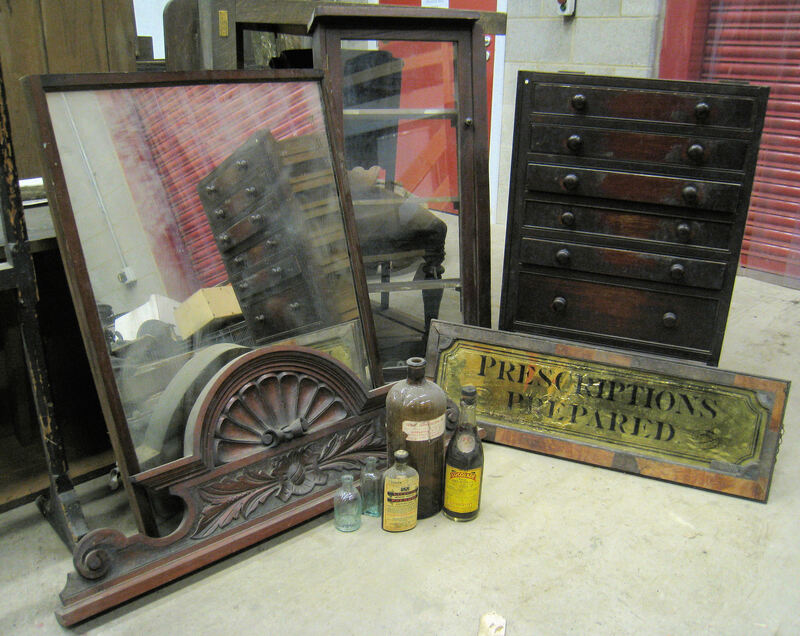 As for the contents, these are still safely in store as sadly the museum does not currently boast a chemist’s shop. Who knows though; some day in the future you might be able to step through the doors of a re-constructed ‘Hallaway’s’! 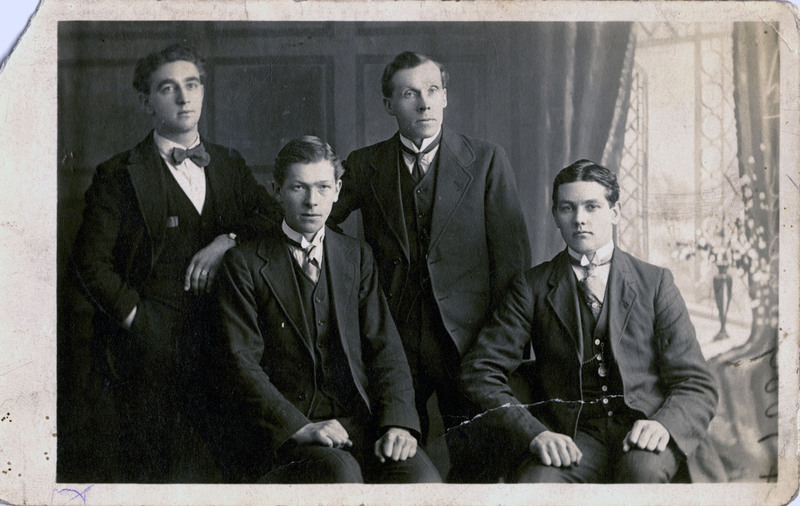 This entry was posted in Adventures in Collecting on March 6, 2013 by BeamishMuseum. The Feeding of the Bairns – what happened next? 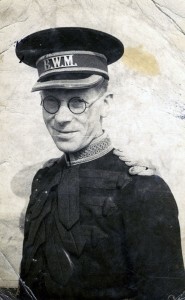 Loyal blog readers might remember that last week we were halfway through the story of the Feeding of the Bairns – starving children, no school meal provision and the Women’s Labour League ready to do battle with the local councils! So what happened next? Faced with remarks by the Newcastle Aldermen in 1908 that the plight of the children was due to the “thriftlessness and ignorance of parents”, the women pushed for their pleas to be heard. 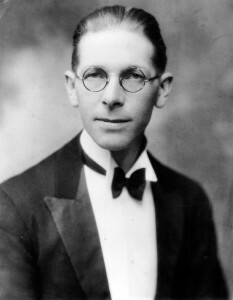 Alderman Richardson’s ‘give them an inch, and they’ll take a mile” mentality boomed with heartless comments that to help the children would encourage poor parenting skills and that poverty was the result of the evil ways of their fathers – let them sort themselves and their children out! 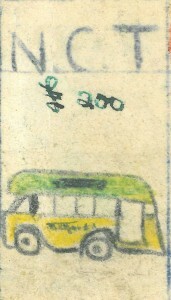 Upset by being labelled a “duffer” in her neighbourhood, a young schoolgirl wrote back in response outlining the condition of her area and the “pale thin children on the street.” She called for common sense, wisdom beyond her years, that in order to become good scholars and grow up to be strong men and women, the council must feed their children. After all, as one famous supermarket brand will tell you themselves, “every little helps”. Success came with the granting of £1500 for 2,600 school children in Newcastle. Would this satisfy the strong willed women of the North East? Why, no! Galvanised, the Gateshead suffrage movement sprung into action. Calling a “Great Women’s Meeting”, the woman cried out to the town council to feed the children and stop relying solely on local charity, who at the time were providing breakfasts for the 600 worst cases. With a resolution to hand they pushed hard to be heard. Rebuffed by the town council, they decided instead to take matters into their own hands. They decided to carry out the “Feeding of the Bairns” in Gateshead to fill the void the council refused to fill. Perhaps this might also shame the council into recognising the errors of their way. 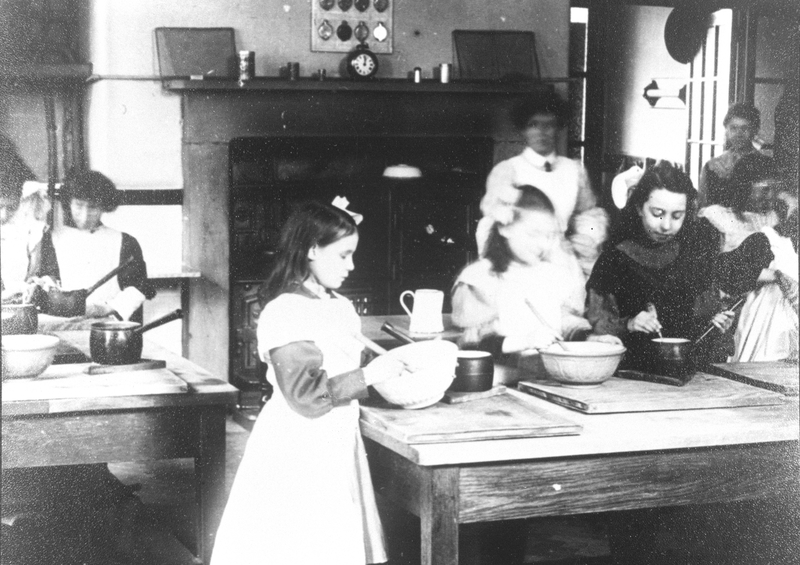 Through a campaign of donated food and begging for scraps, the women came together to cook a hearty soup to put colour back into the pale, thin faces of the Gateshead children. They say soup is good for the soul, and on this date this saying was proven. You may ask, did they succeed in changing the attitude of the town council? In some ways, yes. 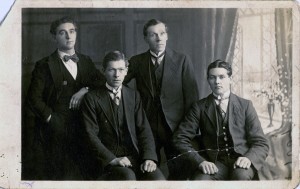 In January 1911, the council began to provide meals in the winter for the worst cases. Progress had made surely. Did the women settle for this as a solution? Of course not! Ground had been gained and there were still many more starving children. For the women of the North East, the cause was ongoing and they continued to battle on. 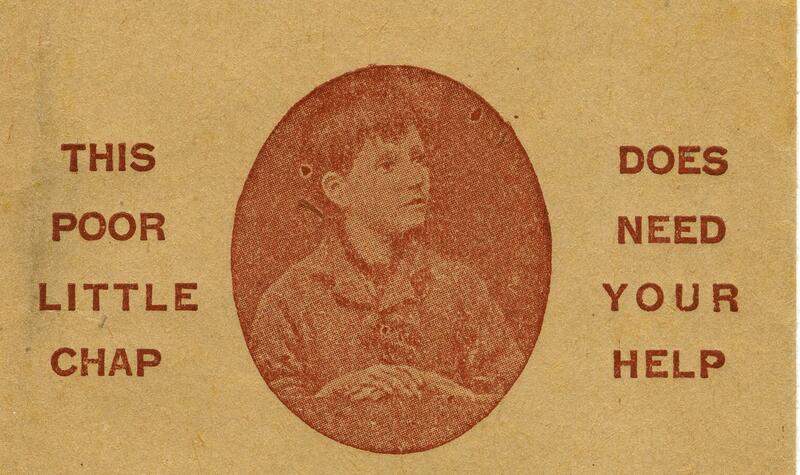 Inspired by this story, I began to lament by bashing of school dinner dishes. Had I taken for granted something that others had been denied that very same century? (I’ll not give away my age here!) Resultantly, we decided that it would be a great way to engage with children today. Using school dinners as a focus, something at the forefront of the tabloids at the moment, we have decided to create this fascinating event using theatrical drama and costume. What else could you expect from us here at Beamish? Armed with soup to hand and Suffragette rosettes pinned proudly on our pinnies, we will work alongside Thomas Hepburn Community School and the Then and Now Group to feed the children of Gateshead their dinner. At the House on the Hill on International Women’s Day, we will hear the engaging speeches of the Suffragettes and boo the Alderman accordingly, washed down with some of Soul Soup’s hearty goodness. We hope to have many come to take part in this performance this Friday 8th March and help right the wrongs of 1910. You won’t be surprised to hear though, I’ve not invited my old dinner lady! 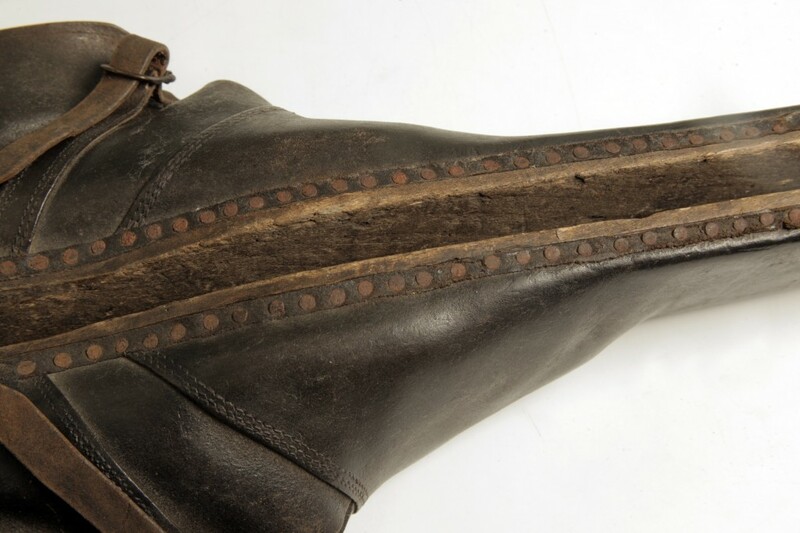 This entry was posted in Adventures in Collecting on March 4, 2013 by BeamishMuseum.